They were of very different in period and architectural style. furthermore, the own now referred to as Gatley Old Hall was apparently always a farm, whilst the other was built as a gentleman's country residence. 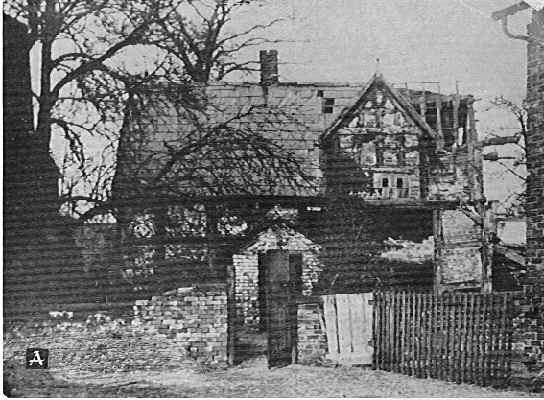 There is no known date of construction but a number of photographs how it to have been genuine half timbered and thatch, and we would date it at about late 16th century. According to the LTA's of Stockport Etchells it was owned by William Bamford from some date prior to 1780 until 1824 and the estate then passed to Hesketh Lloyd Bamford. The Tithe map of 1841 shows the owner as Hesketh LLloyd Bamford Hesketh (He acquired his lengthy name by marriage). For more detail, see Frank Mitchells Book, GATLEY, a pictorial history.